Experience the taste of sizzling Szechuan and colourful Cantonese dishes at Ben Ben Restaurant. 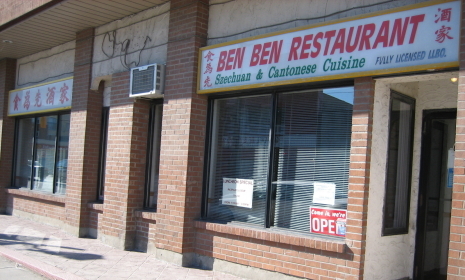 Located in the centre of Ottawa's Asian community, Ben Ben Restaurant has been serving savoury dishes for over 20 years. Come dine in comfort and be served by friendly faces. Try local favourites, such as the Hot and Sour Soup and Singapore Fried Noodles, experience the flavours, and leave with a full stomach!